The Bible teaches that no one can know the date of the Lord’s return. But the Dave Reagan, one of the top Bible prophecy experts in the nation, takes you on an incredible journey through 50 Bible prophecies and how each is being, or has been, fulfilled. Jesus IS coming soon! Great to get fired up and pass around!Bible also clearly teaches that we can know the season of the Lord’s return. I am going to present you with 50 reasons why we are living in the season when Jesus is going to return. Dave Reagan, one of the top Bible prophecy experts in the nation, takes you on an incredible journey through 50 Bible prophecies and how each is being, or has been, fulfilled. Jesus IS coming soon! Great to get fired up and pass around! 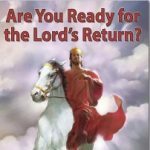 The Bible teaches that no one can know the date of the Lord’s return. But the Bible also clearly teaches that we can know the season of the Lord’s return. I am going to present you with 50 reasons why we are living in the season when Jesus is going to return.